Slovenia, May 30, 2018—The European Commission’s Level(s) initiative offers a unique and unmissable opportunity to make Europe’s buildings more sustainable and in the process tackle climate change, reduce waste, cut energy use and improve well-being and comfort. A high-level workshop has been organised by Knauf Insulation, Europe Regional Network of the World Green Building Council, Slovenia Green Building Council, DGNB and with the support of the Slovenian Government and the European Commission in Slovenia yesterday. 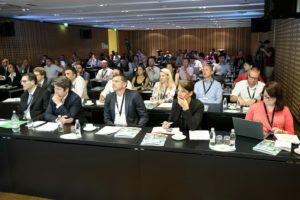 Over a hundred green building specialists, construction industry representatives, policy makers and private investors were brought together to discuss how to maximise the opportunities offered by Level(s) to inspire an exciting new generation of sustainable buildings. Creating a more sustainable built environment is one of Europe’s most pressing problems. Knauf Insulation’s Group Marketing Director Saša Bavec told the workshop that buildings produce 36% of Europe’s CO2, use 50% of all energy, consume half of all extracted materials and generate more than a third of total waste. Josefina Lindblom of the Commission’s DG Environment, Unit Eco-Innovation and Circular Economy, said Level(s) was a vital first step in tackling these issues because it would provide the data needed to understand the environmental, social and economic impact of buildings across their entire lifecycle — using language that everyone could understand. At present Level(s) is in a pilot stage, but it offers huge potential to complement Green Building Rating Systems, shape future building regulations and ‘mainstream’ sustainability by inspiring the private and public sector as well as the building industry. Our new Knauf Insulation Experience Center at Škofja Loka is a Level(s) pilot project building contributing valuable research to the initiative — and was the focus of detailed feedback from our sustainability specialists. “Level(s) is addressing global challenges such as climate change and resource efficiency, but also issues such as building well-being and comfort,” said our Sustainability and Product Regulatory Affairs Director, Vincent Briard. Our Experience Centre will also be Slovenia’s first building to be certified by the DGNB Green Building Rating Scheme. Assessor Robert Smodiš told the workshop it was a privilege to be part of the project but working to the demanding sustainability standards of Level(s) and DGNB was an education for everyone involved. 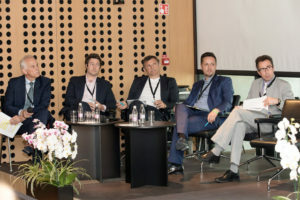 Saša Galonja, Head of Construction Division Spatial Planning, Construction and Housing Directorate, at the Slovenian Environment Ministry, said his government was examining the possibility of using Level(s) to inform the country’s future building sustainability regulations. “We see many positive aspects to Level(s) and we are eager to see where the initiative is going,” he said. Anna Braune, Director of Research and Development of the German Green Building Rating Scheme, DGNB, said: “We use Level(s) as a tool that says, ‘Look this is how the EU is most likely to drive regulation’.” DNGB and Level(s) focus on full lifecycle of buildings, highlight the importance of well-being and comfort and put emphasis on transparent documentation of key aspects of building sustainability, she said. Iztok Kamenski of the Slovenia Green Building Council said his organisation was collaborating closely with public agencies, the private sector, architects and specifiers to deepen understanding of building sustainability through conferences, workshop, education and certification. “Sustainability has to become a new reality,” he said. • Following presentations by key speakers all delegates were taken to see the new Knauf Insulation Experience Center at Škofja Loka. Konferenca A Level(s) pilot project Slovenia 29.5.2018 na Brdu pri Kranju.